Austin is a leading destination for independent and large budget films as well as television & commercial productions. Austin's talented crew base will give you more production value per-dollar spent. 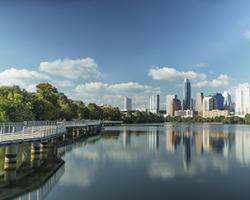 Austin has hill country, lakes & farmland all within 30 minutes of downtown. Austin is surrounded by small towns time has forgotten, perfect for a period piece. Austin's mild climate provides over 300 days of sunshine a year. Austin's local government supports filmmakers, providing free right-of-way permitting. Austin has the infrastructure for production, including studio space and equipment suppliers.